Congratulations to apprentices Shi Sho and Aung Zaw Htwe of Karen background for winning Apprentice of the Year Awards in Mount Gambier. Shi Sho is undertaking his apprenticeship with Nigel Carson Carpentry, whilst Aung Zaw Htwe is completing his apprenticeship with Spanlift Australia. Currently, seven men of Karen and Karenni background are employed by GTE as apprentices. The Mount Gambier MRC looks forward to working with GTE to continue opening pathways to employment for people of migrant and refugee background. 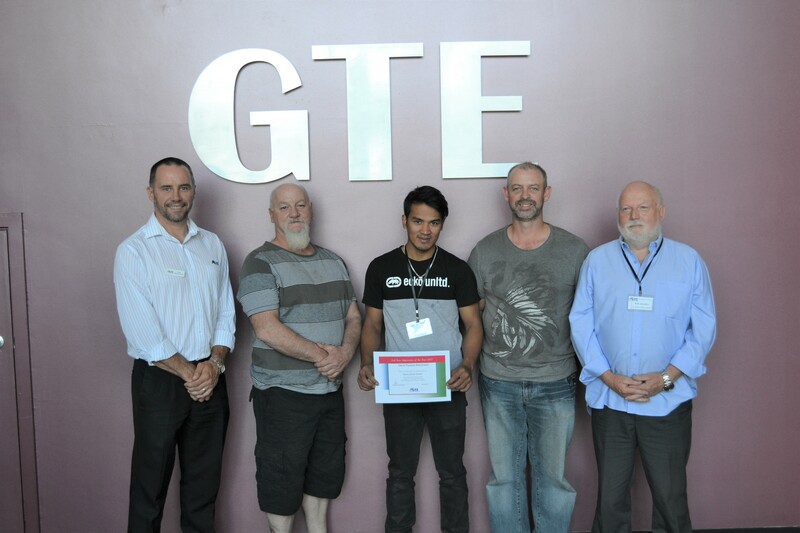 Photo: Brad Wilson-Smith (GTE), Paul Bettens (Spanlift Australia), Aung Zaw Htwe (2nd Year Apprentice of the Year Award), Greg Spicer (Spanlift Australia) and Bob Sandow (Mount Gambier Safety Supplies).